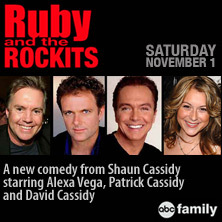 1)"Ruby and the Rockits" is a half-hour, multi-camera comedy starring Alexa Vega ("Spy Kids") as Ruby, the teenage daughter of David Callahan ( David Cassidy) and niece of Patrick Callahan ( Patrick Cassidy), brothers and former teen idols in the band The Rockits. Since David continues to tour and pursue a life in music, he turns to Patrick to help raise Ruby, who joins the Callahan clan consisting of Patrick, his wife and two sons. Austin Butler of "Zoey 101" co-stars. Ruby" was written by former teen idol Shaun Cassidy (Patrick's brother and David's half-brother) and Ed Yeager. Ted Wass directs the pilot, which is executive produced by Shaun Cassidy and Marsh McCall. 2)" The second, Ruby and The Rockits, stars Patrick Cassidy (Smallville) as a teen idol trying to live a quiet family life when his fast-living, former band member and brother David (Partridge Family star David Cassidy)– along with his teenage daughter -- comes unexpectedly into his life. Alexa Vega (Spy Kids) and Austin Butler (Zoey 101) also star in the show, which is executive-produced by Shaun Cassidy (Invasion). 4) "Ruby and The Rockits," is an ABC Studios' half-hour multi-cam comedy series executive produced by Shaun Cassidy ("Invasion") and Marsh McCall ("Carpoolers"), and directed by Ted Wass ("Less Than Perfect"). The series follows Patrick Callahan, a former teen idol who has chosen to lead a quiet life with his wife and two sons. But when his former Rockits band mate and brother, David, shows up unexpectedly with his new-found teenage daughter in tow, the Callahan family's life becomes anything but normal. David, who refuses to give up his past glory days, comes to Patrick for help raising Ruby while he continues to tour. Patrick must now put the past with David behind them in order to help raise Ruby and keep order within the rest of the Callahan clan. "Ruby and The Rockits" was written by former teen idol Shaun Cassidy and Ed Yeager, with teleplay by Ed Yeager. Alexa Vega ("Spy Kids"), Austin Butler ("Zoey 101"), Patrick Cassidy ("Smallville") and former teen idol David Cassidy ("The Partridge Family") star.